Vaccines currently protect humans against approximately 25 different viral or bacterial pathogens, saving an estimated three million lives each year. One viral pathogen, causing smallpox, has been entirely eradicated worldwide as a result of vaccination. Although vaccines have helped fight a broad range of diseases already, the technology behind them is still being developed. At Batavia Biosciences, we focus on accelerating the development of biopharmaceutical products, ensuring that they move from the discovery stage to the clinic as quickly and safely as possible. That way, more diseases can be prevented and more lives can be saved. Vaccines are traditionally made in a laboratory by growing a weakened version of the pathogen (a live attenuated vaccine), by deactivating the pathogen (a whole killed vaccine), or by isolating individual protein segments of the pathogen (virus-like particles or recombinant protein-based vaccines). These traditional vaccines trigger a potent antibody response when given to a host. The antibodies recognise and eliminate the virus and thus, as long as such antibodies are circulating in the body, an individual is protected against that specific pathogen. As the number of antibodies can fade over time, booster vaccinations may be required to keep the immune system in check. Vaccines capable of providing long-term protection also elicit cellular immunity alongside the antibody response. In this case, T cells present in the blood are activated and able to recognise and eliminate pathogens hiding within cells. A relatively new vaccine technology, which is particularly potent in triggering both an antibody as well as a T cell response in a host, is based on vectors. Vectors are commonly derived from ‘benign’ viruses or bacteria that have been genetically altered in such a way that they are still capable of infecting human cells but cannot reproduce, meaning a disease cannot be established. Vectors can accommodate foreign genetic material encoding for virus-derived, parasite-derived or bacteria-derived proteins. Upon vaccination, the foreign genetic material is transferred to the host cells and eventually presented to the host immune system. 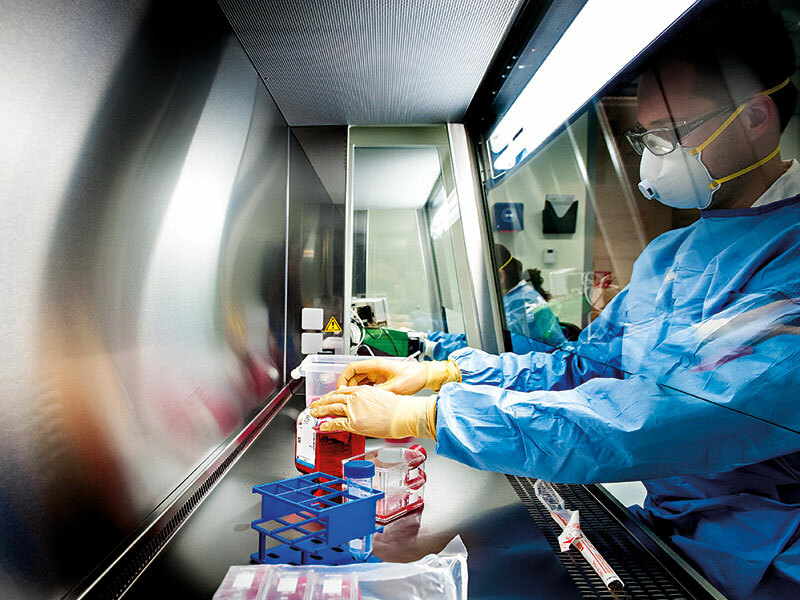 As a consequence of the broadness and potency of the immune response triggered by vectors, this technology is now at the heart of many novel vaccine development programmes. These include HIV, the Plasmodium falciparum parasite (which causes malaria) and Mycobacterium tuberculosis (which causes tuberculosis). Overall, vector-based vaccines currently comprise 26 percent of all genetically modified vaccines in the product pipeline, most of which use either the Modified Vaccinia Ankara, the adenovirus, the cytomegalovirus or the vesicular stomatitis virus vector. Vectors promise to provide an efficient, safe and affordable technology platform for the development of many new vaccines. The idea behind this is that by simply changing the foreign DNA content in a vector, a new vaccine could be launched using standardised manufacturing lines. That said, there are certainly challenges that need to be solved, including stability and yield of vector production from cell culture. Therefore, new vector-based vaccines are being tested in human clinical trials for safety and efficacy, while research on vector design, production procedures and purification methods is continuing in the laboratory setting. This approach is warranted because valuable lessons taken from clinical trials are pivotal to the development of improved next-generation vectors. Here, life sciences companies developing vector-based vaccines work intimately together with contract development and manufacturing organisations (CDMOs), like Batavia Biosciences, to develop robust and efficient production processes and deliver clinical products, while focusing internal resources on improving the vector design or production platform technology. As a CDMO, Batavia Biosciences has all the technology, experience and capabilities required to re-engineer vectors, execute scale-up and manufacturing, and deliver both product and vector-specific tests. We have already delivered many vector-based vaccines for testing in clinical trials both in Europe and the US, and continue to explore ways of bringing our medicines to new markets.